More information being released as the 2015 Mustang rollout continues. 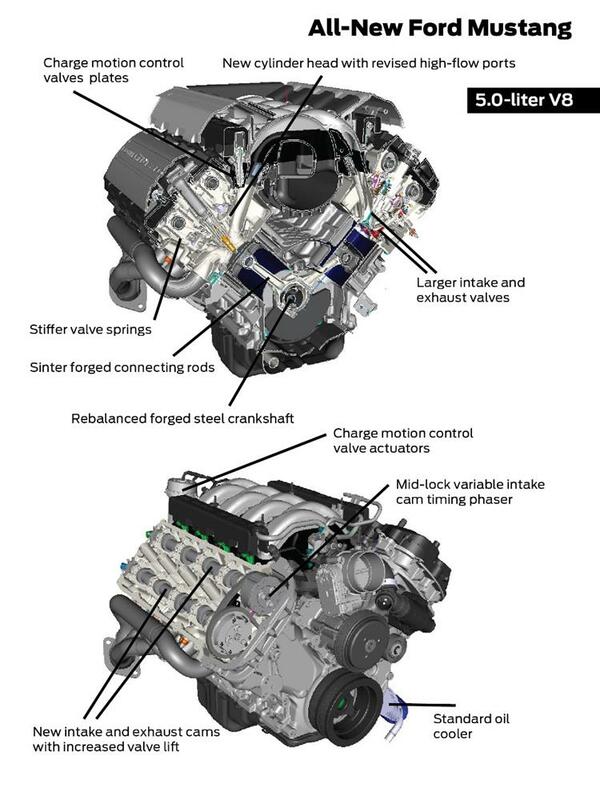 Here are the details on the new 2.3 liter EcoBoost 4 cylinder, as well as the changes to the Coyote engine for the GT. The new 2.3-liter EcoBoost engine brings turbocharging to the Mustang powertrain lineup. Designed to meet the needs of drivers looking for outstanding performance and projected best-in-class fuel efficiency, this EcoBoost engine has been developed specifically for Mustang. The intake manifold and turbocharger housing are optimized to provide better breathing and higher output in Mustang. 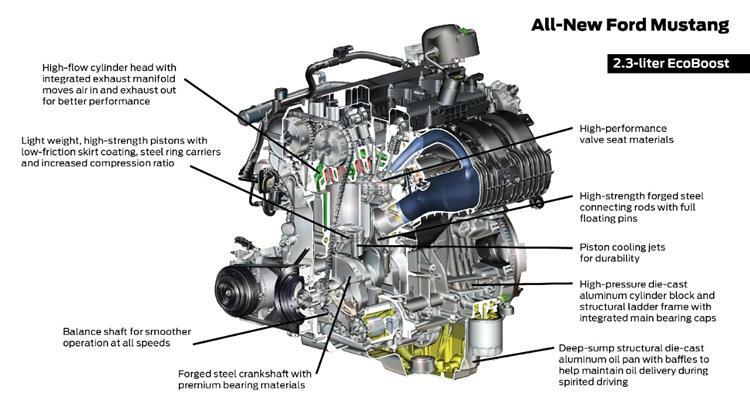 The newest member of Ford’s global family of EcoBoost engines, the 2.3-liter continues to take advantage of state-of-the-art technologies including direct fuel injection, twin independent variable camshaft timing and turbocharging to produce big-engine power and torque with improved fuel efficiency. This is the first Ford engine to utilize a low-inertia twin-scroll turbocharger that provides quicker boost response while enabling lower emissions and improved efficiency. The cylinder head features an integrated exhaust manifold that separates the inner and outer pairs of cylinders into each inlet passage to the turbo. Keeping the exhaust pulses separated from the next cylinder in the firing order eliminates mixing losses and maximizes pulse energy to the turbine wheel. The result is quicker torque delivery when the driver needs it for passing maneuvers and similar performance to a twin-turbocharger configuration. The separated exhaust ports also enable the exhaust valves to stay open longer for reduced pumping losses that improve specific fuel consumption by about 1 percent. A new intake manifold includes charge motion control valves to partially close off port flow at lower engine speeds. This increases the air charge tumble and swirl for improved air-fuel mixing. This results in better fuel economy, idle stability and lower emissions. Transmissions More than most drivers, Mustang owners like to take control and shift for themselves. Whether they select a fully manual gearbox or the updated automatic transmission, the experience will be better than in any previous pony. The automatic also features a redesigned case with cast-in ribs that help make it stiffer and reduce the weight. Internally clutches have been optimized and operating temperature has been increased to reduce friction. The output shaft is now supported by a ball-bearing that enables a top speed of 155 mph for Mustang GT.